Mirror Universe: What would be your dream Star Trek Series be? It's time to share our fan fiction again and this time we're taking it to where a lot of people have been talking about for decades. Elseworld: What would be your dream Film Justice League team be? 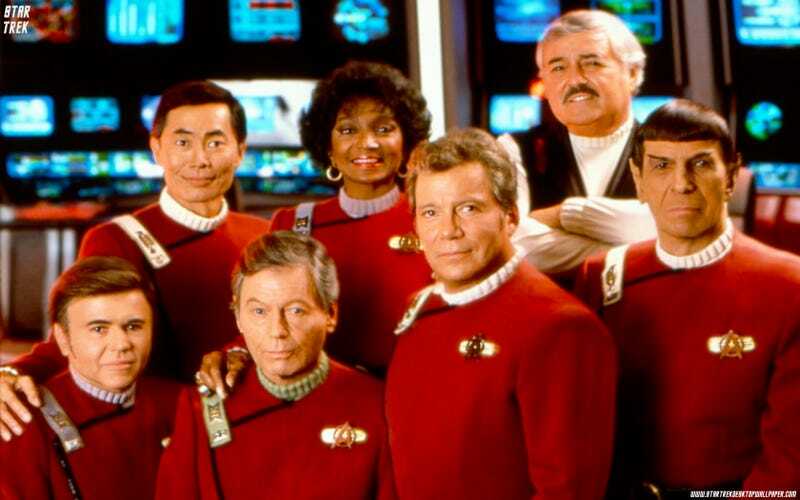 It is likely that there is no new Star Trek series coming in the distant future. The closest is the Captain Worf series Michael Dorn has being trying to get green-light for years now (and from a recent update, Paramount are still on the fence on that). Personally, I have never been much of a Worf fan so I'm not the greatest fan of the idea. However that doesn't mean we can't dream about our new Star Trek series and think about own ideas. Imagine, you find yourself in a mirror universe being dragged into a dark room. A giant man bashes a piece of paper and a pen to you and demands you to create a new Star Trek series in 20 minutes, under threat of the Agony Booth. What would be your cast? Remember not to fall into the trap of making someone the, "the Black Guy" like Voyager did with Chakotay and native Americans. When and where would it be set? Will you stay in the current movie universe? Go back to the prime universe. Set in the further future like 24th or 25th century. How is your galaxy like? Who would you deal with Aliens? How about themes and idea? For me, my dream universe would be set in the early 26th century where the federation has suffered great losses, both economically and militarily. In order to survive and with no one willing or capable to help the large Federation (some throwing the Prime Directive back in their faces), it has had to an union with the Dominion, a union that wasn't popular in the Federation. Themes I would like explore is the idea of past enemies having to reconcile there differences and prejudices. I also want to see more exploration of life in the federation is like. We've never had a good view of this, we know nothing of there music, entertainment and the different cultures. I would have less of the aliens of the week and instead focus on fewer but more diverse aliens. Lastly, I want my series to explore sexuality, something I feel Star Trek has never truly done in any great detail except in juvenile ways like in Enterprise's Similitude due to cowardice of the executives (look up the never made episode Blood & Fire for example). Capt Rei Koizumi, commanding officer and with having to command the first joint Dominion/Star Fleet crew. Cmdr F-19, First and Science Officer and struggles in being a free Jem'hadar. Lt. Cmdr Caska Alexis, Second Officer and Chief Engineer and is also Transgendered (but not treated as the Transgendered one but a person who happens to be Transgendered). Lt. Devana Tos, Security Chief and a Romulan refugee from the conquered Romulan space by the Klingons. Lt Jr.Ron Wolf Piller, Tactical Officer and an older man who suffers from prejudice with the Dominion. En. Devon Willis, Intelligence Officer and is rather shy.